Possibly Shakespeare's single best-known play, arguably his most complex and certainly his longest, Hamlet is thought to have been written in 1599-1600. Inspired by the true story of Danish prince Amled, it could have been staged as a straightforward revenge drama, but in the event Shakespeare adds so many layers that it becomes a dazzling work of philosophy, not least in terms of its self-awareness about the nature of theatre. So much a cornerstone of world literature that huge chunks will be immediately recognised even by people who have never consciously watched a production, it is open to endless reinterpretation, and has consequently seen a wider range of adaptations than any other Shakespeare play - both on stage (it is believed that the play has never been out of the repertory since its first performance) and screens large and small. The first British film Hamlet is believed to have been made by Will Barker in 1910, starring Charles Raymond , but this is now considered lost. However, Hay Plumb's 1913 production for the Cecil Hepworth company survives in its entirety. Like most silent Shakespeare films, it is compromised by the removal of most of the original text, leaving only brief excerpts in the intertitles. Although at 5,800 feet (up to 90 minutes depending on projection speed) made it by far the longest and most complete British Shakespeare film up to that point, it nonetheless still required prior knowledge of the play for full comprehension. Sir Johnston Forbes-Robertson , one of the Victorian era's great stage Hamlets, played the title role, despite being in his sixtieth year and close to retirement. The Cricks and Martin company made a film called Hamlet in 1915, which is now thought lost - though if its reported length of 908 feet is correct, it would have been an extreme shortening of the play. Equally brief was the 1916 production Pimple as Hamlet, a vehicle for the popular silent comedian that is unlikely to add much to Shakespeare scholarship. The next British film Hamlet came over thirty years later, but was well worth the wait. A follow-up to Laurence Olivier's triumphant Henry V (1944), his Hamlet (1948) was strikingly different: whereas the earlier film had an explicitly political motive, here the politics are removed almost entirely, with Olivier focusing on the relationship between Hamlet, Claudius ( Basil Sydney ), Gertrude ( Eileen Herlie ) and Ophelia ( Jean Simmons ), played out in a gloomy, cavernous Elsinore whose spaces were emphasised by long deep-focus takes. A huge critical and commercial success, it was the first British film (indeed, the first non-American film) to win an Oscar for Best Picture alongside Best Actor (Olivier), Best Costume Design and Best Set Decoration. There would not be another large-scale big-screen British Hamlet for over forty years, but Tony Richardson preserved his stage production at the Camden Roundhouse in 1969. Heavily cut to under two hours, attention was firmly focused on Nicol Williamson's Hamlet, the main beneficiary of Richardson's strategy of filming almost everything in tight close-up. 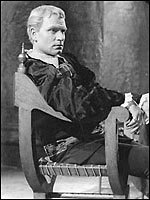 Very much a product of its time, Williamson presents Hamlet as an explicitly anti-Establishment figure (the production was popularly known as the "angry young man Hamlet"), railing against the forces of conservatism represented by Anthony Hopkins (Claudius) and Judy Parfitt (Gertrude). Eyebrows were raised when Franco Zeffirelli announced that Mel Gibson would play the title role in his version of Hamlet (US/UK/France, 1990), though the consensus was that the Mad Max / Lethal Weapon star was surprisingly effective given his lack of Shakespeare experience. Unsurprisingly, he played Hamlet very much as a dynamic man of action, helped by copious cutting (to 130 minutes) and reworking to turn the play into a much more fast-paced narrative experience, though with the inevitable side effect of cutting much of the poetry and philosophy. Gibson's co-stars included the rather more seasoned Shakespeareans Alan Bates (Claudius), Glenn Close (Gertrude), Paul Scofield (Ghost), Helena Bonham Carter (Ophelia) and, outstandingly, Ian Holm (Polonius). Kenneth Branagh directed and played the title role in a large-scale production (US/UK, 1996) distinguished both for its 70mm cinematography (it was the first British film to be shot in the format since David Lean's Ryan's Daughter 26 years earlier) and for its presentation of the uncut text, which stretched the running time to 242 minutes. The sense of occasion was enhanced by a very strong cast that included Derek Jacobi (Claudius), Julie Christie (Gertrude), Kate Winslet (Ophelia) and Richard Briers (Polonius), though the decision to cast major stars in minor roles ( Jack Lemmon as the watchman Marcellus, Gérard Depardieu as Polonius' servant Reynaldo) proved more distracting than illuminating. That said, Robin Williams ' Osric and Billy Crystal's Gravedigger were both excellent and Charlton Heston's Player King was arguably his finest Shakespeare performance on film. Presumably because of its length, Hamlet has had fewer television adaptations than many of the other great tragedies, though the quality threshold has been commendably high. The earliest television Hamlet was shown in two parts by the BBC on 7 and 14 December 1947. The live broadcast was not recorded, though each part was 'repeated' two days later by rounding up the cast and getting them to perform it again. George More O'Ferrall oversaw the production, whose cast included John Byron (Hamlet), Sebastian Shaw (Claudius), Margaret Rawlings (Gertrude), Muriel Pavlow (Ophelia), Arthur Wontner (Polonius), Patrick Troughton (Horatio) and Patrick Macnee (Laertes). The second television version of the play survives in its entirety. This is doubly fortunate, as the 170-minute Hamlet at Elsinore (BBC, tx. 19/4/1964) was also an outstanding production, made as the BBC's major contribution to the Bard's 400th birthday. A co-production with Danish Television , it was shot entirely on location at the real Elsinore Castle in Denmark and, despite numerous technical challenges and unscheduled thunderstorms (and foghorns), director Philip Saville turned in a remarkably coherent and visually flamboyant piece of work. He was helped by a superb Hamlet from Christopher Plummer , who had built up a formidable reputation as a Shakespearean stage actor over the previous decade, while the equally distinguished supporting cast included Robert Shaw (Claudius), Alec Clunes (Polonius), June Tobin (Gertrude) and even a young Michael Caine (Horatio). The third television Hamlet (BBC, tx. 23/9/1972) was based on an existing stage source: Robert Chetwyn's Prospect Theatre production starring Ian McKellen (Hamlet), John Woodvine (Claudius), Faith Brook (Gertrude) and Susan Fleetwood (Ophelia). It had already amassed a substantial reputation before the broadcast - indeed, it played a significant role in establishing McKellen's reputation - and so director David Giles (who would later helm many of the BBC Television Shakespeare productions) wisely made little attempt at obscuring its theatrical roots, though he did devise imaginative visual treatments of some key scenes. The Ghost scene is especially striking, with two simultaneous images of McKellen's face superimposed on top of one another. The BBC Television Shakespeare production, whose full title was Hamlet, Prince of Denmark , was broadcast on 25 May 1980, between the second and third series. Rodney Bennett's stark, spare production relied heavily on close-ups of its high-calibre cast, which included Derek Jacobi (Hamlet), Patrick Stewart (Claudius), Claire Bloom (Gertrude), Eric Porter (Polonius) and Lalla Ward (Ophelia). Producer Cedric Messina originally envisaged an uncut performance, but in the event he was persuaded to cut 500 extraneous lines to get the production down to three-and-a-half hours (doubly necessary given that the same evening saw the broadcast of a 25-minute Shakespeare in Perspective documentary presented by the writer and critic Clive James ). However, it remains the longest television Hamlet to date. The most recent television Hamlet to date was another stage adaptation, this time sourced from Peter Brook's characteristically minimalist production for his Paris-based Bouffes du Nord theatre company. Staged on an almost bare, blood-red set, Peter Brook's Hamlet (BBC, tx. 6/3/2002) sought to strip away centuries of imposed interpretation by concentrating on Shakespeare's actual words - often rearranged into different contexts (the "to be or not to be" soliloquy followed Polonius' murder) to ensure that even people supposedly familiar with the play would experience them afresh. He was ideally served by Adrian Lester's virtuoso Hamlet, backed by a tiny cast playing multiple roles (for instance, Jeffrey Kissoon's combined Ghost and Claudius). Sadly, though unsurprisingly, the end result was considered too daunting for mainstream television audiences, and it was only shown on the digital BBC4 channel. An even more radical reinvention of the play had been carried out by Celestino Coronado in a 16mm-and-video project made at the Royal College of Art in 1976. Taking its cue from Hamlet's speech to Gertrude concerning "the counterfeit presentment of two brothers", Coronado casts identical twins Anthony and David Meyer as not only twin Hamlets but also the Ghost, Laertes and the Player King, with Helen Mirren playing both Gertrude and Ophelia. Though the budget was admittedly tiny, this was not a money-saving device: this doubling served to emphasise the way the play's characters frequently mirror each other in method and motivation. Even this was not the first cut-up and reshuffled Hamlet to go before the cameras: seven years earlier (BBC, tx. 30/12/1969), Late-Night Line-Up discussed Charles Marowitz' collage reinvention of the play, with filmed examples performed by the Open Space Theatre Company . There have been at least four animated versions of Hamlet, the first two made by Anson Dyer. 'Amlet (1919) no longer survives, but contemporary accounts suggest that it presented the title character as a Charlie Chaplin figure who uses his filmmaking skills to reconstruct his uncle's crimes before presenting him with the evidence at the Elsinore Film Palace ('Amlet tries to make out his reaction with an electric usher's torch). From that description, it sounds as though it has more in common with Shakespeare's original than does its companion-piece Oh'phelia (1919), a cut-out cartoon burlesque that turns the tragic heroine into a victim of farcical misadventure that leads to an uncharacteristically happy ending. The third animated Hamlet was the twelve-minute Act V (1981), directed by John Miller , which depicts the graveside scene where Hamlet and Horatio meet the Gravedigger ('Alas, poor Yorick') with vocal contributions from John Junkin , Peter Marinker and Peter Dennis . But the most substantial animated Hamlet was the one made for the first series of Shakespeare: The Animated Tales (BBC, tx. 7/12/1992), directed by the Russian animator Natalia Orlova from a script by the novelist Leon Garfield . Despite being shortened to 26 minutes, the result is surprisingly effective, with most of the best-known lines and narrative elements being retained. While the philosophical soliloquies are heavily truncated, the fusion of the remaining text and some powerfully evocative near-monochrome images (Polonius' blood seeping through the arras, a crane soaring heavenwards from the dying Ophelia) result in less being lost than might initially appear to be the case. The animation was created by painting directly onto layered panes of glass, a technique that demanded enormous patience and precision, though Orlova was satisfied enough with the end result to make the second series' Richard III in a similar style. The vocal cast included Michael Kitchen (narrator), Nicholas Farrell (Hamlet), John Shrapnel (Claudius/Ghost), Susan Fleetwood (Gertrude), Tilda Swinton (Ophelia) and John Warner (Polonius). There have been several television documentaries about the play. Hamlet Revisited (BBC, tx. 22/10/1970) explored the title character. The programme was introduced by John Gielgud (whose own rendition had been preserved some 25 years earlier in Humphrey Jennings' A Diary for Timothy ), and included excerpts from past Hamlets by Laurence Olivier , John Barrymore , Nicol Williamson , Maximilian Schell , Richard Chamberlain and others. Hamlet was the subject of Shakespeare Lives series (Channel 4, tx.16 & 23/3/1983), a two-part hour-long dissection of the play with director Michael Bogdanov staging individual scenes with National Theatre personnel ( Clive Arrindell , Suzanne Bertish , Michael Bryant , Joss Buckley , John Darrell , John Labanowski , Dinsdale Landen and Bill Wallis ) before analysing them with the aid of a live audience. The overall question was whether the play was about a young man with an Oedipus complex, or a Northern European power struggle of Watergate proportions. ITV arts flagship The South Bank Show has mentioned the play on numerous occasions, including a programme on Jonathan Pryce's Royal Court production (ITV, tx. 1/6/1980) and one examining Hamlet's enduring popularity (tx. 2/4/1989), based around interviews with directors of three 1989 productions: Richard Eyre ( National Theatre ), Ron Daniels ( Royal Shakespeare Company ) and the controversial production by the Russian director Yuri Lyubimov , which was also discussed by The Late Show (BBC, tx. 14/9/1989). The BBC's ambitious Bard on the Box season (October-November 1994) included the documentary Playing the Dane (tx. 30/10/1994), in which actors Sir Ian McKellen , Richard Briers , Jeremy Brett , Steven Berkoff , Frances de la Tour , Kevin Kline , Christopher Walken , Christopher Plummer , Stacy Keach and Tom Hulce discuss the experience of playing Shakespeare's most demanding role, and asking whether its reputation as an acting benchmark is really justified. There have been two further feature films directly inspired by Hamlet-related material. Rosencrantz and Guildenstern Are Dead (US/UK, 1990) was adapted and directed by Tom Stoppard from his own breakthrough 1967 play which imagined the events of Hamlet as seen from the viewpoint of two of its most marginal characters. Although an inescapably theatrical conceit, it worked surprisingly well on screen thanks to strong performances by Gary Oldman and Tim Roth in the title roles and a screenplay that took more liberties with the original text than a different writer might have dared. Going from spin-off to source, Prince of Jutland (1994) was a French-British-Danish-German co-production directed by Gabriel Axel , based on the ancient Viking saga by Saxo Grammaticus that was one of Shakespeare's sources. Christian Bale played the title role (called Amled here), with support from Gabriel Byrne , Helen Mirren , Brian Cox and Kate Beckinsale . Finally, Hamlet plays a pivotal role in Bruce Robinson's end-of-an-era comedy Withnail & I (1986), with explicit references in two scenes. The perfectly-pitched ending, with unemployed actor Withnail ( Richard E. Grant ) desperately reciting the Act II soliloquy ("I have of late, but wherefore I know not, lost all my mirth") in Regents' Park to a clutch of bedraggled, disinterested wolves, is the best-known, but perhaps more telling is the earlier reference by Withnail's Uncle Monty ( Richard Griffiths ) in which he reminisces about the shattering realisation that he would never "play the Dane". He then, sotto voce, launches into a recitation from the play, which turns out to be a speech by the nightwatchman Marcellus ("We do it wrong, being so majestical...") - a deft sketch of what was clearly the only role in the play that Monty was considered capable of tackling.